The origins of our company date back to the establishment of Ogaki Denki Yakin Kogyosho in 1925. It was subsequently restructured as Nippon Denki Yakin and in 1963 merged with Toho Denka to form Nippon Denko. In July 2014, following a business merger with Chuo Denki Kogyo, the company changed its Japanese name to “Shin (New) Nippon Denko” — although the English name remained unchanged. In January 2018, Chuo Denki Kogyo became a wholly owned subsidiary of Nippon Denko. Since the time it was founded, our company’s factories around Japan have handled the production of various ferroalloys such as silicone, chromium, and manganese ferroalloys, but the high cost of electricity and the strengthening of the yen inevitably led us to withdraw from the domestic manufacturing of products where our competitiveness was declining, and we therefore are currently focused on the production of manganese ferroalloy. At the same time, we have steadily been developing our environmental systems and functional materials businesses, which are areas that are less affected by market conditions and where we expect to see stable earnings. Our company’s strength is that, in the primary core business of ferroalloys, as a result of our prioritizing the injection of business resources into high carbon ferromanganese and pursuing maximum cost reductions, we have maintained superior international competitiveness while simultaneously meeting the highest levels demanded for international environmental standards. Also, Japan is the world’s second largest producer of steel, and there are many outstanding and extremely stable domestic users of our products, including Nippon Steel & Sumitomo Metal as well as blast furnace manufacturers, electric furnace manufacturers, special steel manufacturers, and others. Moreover, in the long term, the global demand for steel is rising, and in particular we believe that we will see an increase in the consumption of manganese products, which are essential to the production of high-performance steel materials. Moreover, thanks to our long history of achievements in the ferroalloy business, our company is enjoying an extremely positive and robust financial position. As the domestic and international environment surrounding our company’s business undergoes rapid and dramatic changes, our management principle remains constant: “To develop and provide products, technologies, and services that differentiate us from other companies, boost corporate value, and contribute to the creation of a prosperous society.” Based on that principle, we will work to maximize our company’s strengths, use our management resources to their fullest, and resolutely strive to resolve the challenges facing our business. 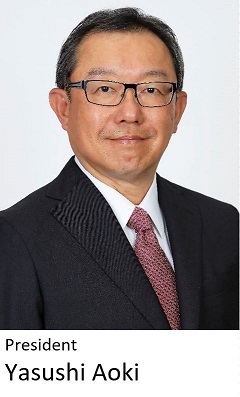 Under Nippon Denko’s 6th Medium Term Business Plan (2015–2017), we achieved our objective of “restructuring our business portfolio through selection and concentration,” pursuing 4 core businesses through the addition of two new areas—the “environmental systems business,” which responds to the needs of a recycling society, and the “electric power business,” which operates hydraulic power plants using the Feed-in-Tariff Scheme for Renewable Energy—to our existing “ferroalloy business” and “functional materials business.” Under the 7th Medium Term Business Plan (2018–2020) that began this year, our entire corporate group will work together as one and dedicate our efforts to further improving the value of our firm based on the following basic policy. 1.Further develop our 4 core businesses ferroalloys, functional materials, environmental systems, and electric power to create a stable revenue generation system on a consolidated basis. 2.Thoroughly integrate and link corporate resources, including personnel, capital, facilities, technology, and data, in order to quickly and fully produce synergistic benefits. 3.Build a corporate foundation that enables the group to achieve further growth and is suitable for a listed company, and make a fresh start as a group in which our stakeholders have faith and confidence. To all of our stakeholders—our customers and partners, our shareholders, and others—we hope that you will continue to offer us your understanding and support. Nippon Denko Group has two major manufacturing sites in Japan, our Tokushima Plant and our Kashima Plant, where we are using proven technologies to produce a steady supply of high-quality manganese ferroalloy. In addition to manganese, we also handle a variety of other ferroalloy products and continue to receive high marks from users as the top producer of ferroalloys. As a component used in cathodes for lithium-ion batteries, lithium-manganese oxide provides the foundation for energy-saving devices that contribute to carbon dioxide reduction, as does ferro boron , the raw material used in amorphous alloys and NdFeB magnets. Lithium-ion batteries are used as a power source in electric vehicles (EVs) and hybrid electric vehicles (HEVs), and as the electric power storage modules supporting smart grids, while amorphous alloys are used in high-efficiency transformers, and NdFeB magnets are used in motors for EVs, HEVs, and wind turbine generators. These contribute to building an environmentally harmonious society. Also, metal hydride alloys are used in the nickel-hydrogen batteries installed in hybrid vehicles, while manganese inorganic chemicals are used in a wide range of fields, including surface treatment materials, dietary supplements, animal feed, fertilizers, and more. Our environmental systems business provides water treatment products and services using ion-exchange resin and reverse osmosis membranes. We are responding to the growing needs of industry by offering plans to purify industrial drainage and recover valuable materials, and by providing water purifiers for energy farms and water treatment equipment for hydrogen stations. In addition, Chuo Denki Kogyo’s electric furnaces are being used to melt and solidify incinerated ash, a business that responds to the strong demand from society to detoxify and reduce waste as well as recycle it. Nippon Denko’s Horoman-gawa hydroelectric power plants, located in the Hidaka region of Hokkaido, received approval under the Feed-in-Tariff Scheme for Renewable Energy. The Horoman-gawa river system runs through an extremely bountiful natural environment as it is located within the Mt. Apoi Geopark area in the town of Samani, which is recognized as a Global Geopark. We will continue to be conscious of this environment and will strive to contribute to society while securing steady profits through our clean, renewable energy business.